David Cameron’s government has given the unions plenty of reasons to play hardball, unwisely and cynically hoping he could use the Olympics to force through measures they despise. Now it’s backfiring on him. Britain’s Border Agency union said talks with the government on pay and jobs aren’t planned until next week, making it unlikely that a strike at London’s Heathrow airport on the eve of the Olympic Games will be called off. Previous talks failed because Home Office officials were bound by policy commitments, and the government needs to appoint negotiators with authority to make changes, said Richard Simcox, a spokesman for the Public and Commercial Services Union, which says it represents two-thirds of Heathrow immigration officers. U.K. unions are squeezing Prime Minister David Cameron’s coalition government in the run-up to the London Olympics as they seek to stymie public-sector cost cuts being implemented as part of a 155 billion-pound ($243 billion) austerity drive. Rail union Aslef said yesterday that drivers will strike for three days at Stagecoach Group Plc’s East Midlands Trains, which connects London with Loughborough, the location of the main preparation camp for U.K. athletes competing in the Games. Train drivers will walk out on Aug. 6, when the men’s 400 meters final will be held, and the following two days. The action “threatens Team GB’s ability to plan travel from their U.K. base in Loughborough and would disrupt journeys for thousands of commuters and spectators,” Transport Secretary Justine Greening said. Some 20,000 London bus workers this week approved a deal awarding them payments averaging 577 pounds for working during the Olympics and Paralympics. The accord was struck after the Olympic Delivery Authority provided 8.3 million pounds of funds, according to local authority-controlled Transport for London, which will also pass half of any extra fare revenue generated during the games to bus operators for distribution to staff. In addition to their one-day strike, immigration officials will refuse overtime and work strictly to contract between July 27 and Aug. 20, according to the PCS. Heathrow, through which the bulk of overseas competitors are arriving for the Games, will aim to maintain a “smooth and secure” service through any strike action, owner BAA Ltd. said. A deployment of extra Border Agency staff since athletes and officials began arriving at Europe’s busiest airport at the start of this week has so far keep immigration waiting times “well within targets,” it says. Simcox said the government will most likely bring in replacement staff without full training as emergency cover. 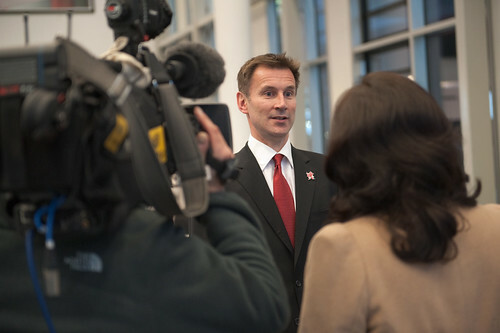 Culture minister Jeremy Hunt. Photo courtesy University of Salford Press Office. In an unrelated dispute over access to dedicated “Games Lanes” on London’s roads, set aside for athletes and officials, about 400 black-taxi drivers plan to block traffic on July 23 and again on July 27, the day of the opening ceremony, according to Cabbies Against Boris, named for London Mayor Boris Johnson. Protests will continue during the Games unless the government intervenes to grant taxis the same access as the buses hired to carry participants, spokesman Dave Davies says. U.K. Culture Secretary Jeremy Hunt said yesterday that there’s currently no need to deploy further troops to protect the Games as guards recruited by G4S Plc arrive on site. The government has already assigned 3,500 extra soldiers after G4S said it couldn’t meet the terms of its 284 million-pound contract to provide 10,000 security personnel. Defense Secretary Philip Hammond has pledged that no members of the armed forces will lose leave or be left out of pocket as a result of the Olympics deployment, though it’s not clear that they’ll receive any special payments. “Work continues on a broader welfare package and further steps to recognize the military’s contribution,” the Ministry of Defence said in a statement July 17. G4S Chief Executive Officer Nick Buckles told lawmakers the same day that his company will cover extra costs for soldiers and police and will consider paying a bonus in line with those granted to transport workers. Standard & Poor’s today placed G4S’s credit ratings under review for possible downgrade, saying it would resolve the issue after meeting with management following the Olympics. The Crawley, England-based based company’s long-term rating is currently BBB, two levels above non-investment grade or junk.